Mike got his new machine, so we spent the weekend trying it out. It’s a Powertrac brand, and we don’t know the name of the machine itself, so we’ve decided to call it “the powertrac”. 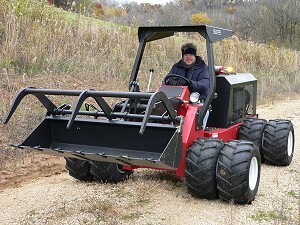 It’s like a low tractor, with the implements on the front, and articulated, so it can snake around obstacles. It’s supposed to be especially good for mowing and working on the sides of steep hills. Mike is delighted with it. We bought a mower, a tree sheer, and a bucket to go with it. The bucket works very well – it has big teeth, so it’s easy to pick things up, and it holds a lot of stuff. We made a huge burn pile of all the logs. We tried the tree sheer on a stand of sumacs and Gray Dogwood, but it doesn’t work very well. It only cuts very small trees, and in order to get to them Mike had to spend time cutting a lot of tiny trees that were in the way. It turned out to be very slow and cumbersome, and was much easier to do with the mower and a chain saw. But maybe we’ll find a use for the tree sheer some other time. 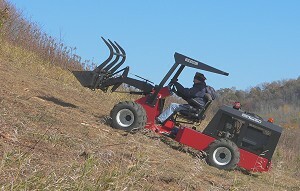 We tried the mower on the top of Hidden Oaks Prairie, and it goes through almost anything. 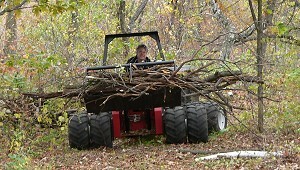 Mike is getting really good at using the bucket to pick up huge piles of brush without leaving much of anything behind.